4-23-2019: New analyses of mouse sorted cells at PND1 and PND 14 are available in LungSortedCell Panel. 3-18-2019: ATS Webinar on the LungMAP PART 1 & PART 2. 2-6-2019: LGEA added in mouse E16.5 dropseq dataset, mouse PND7 dropseq dataset, and mouse PND28 dropseq dataset. 1-23-2019: LGEA added in a study of A revised airway epithelial hierarchy includes CFTR-expressing ionocytes from Rajagopal Lab in LGEA-ExternalData panel. Check out its analyses: Gene query(dropseq), Cell type query(dropseq), Gene query(C1 scRNA-seq), Cell type query(C1 scRNA-seq) and Gene query(pulse-seq). 1-3-2019: Check out our recent publication, "Single cell RNA analysis identifies cellular heterogeneity and adaptive responses of the lung at birth" published in Nature Communication. 11-20-2018: Check out our recent publication: Whitsett, Jeffrey A., et al. Building and Regenerating the Lung Cell by Cell. Physiological reviews 99.1 (2018): 513-554. 1. Du Y, Guo M, Whitsett JA, Xu Y. 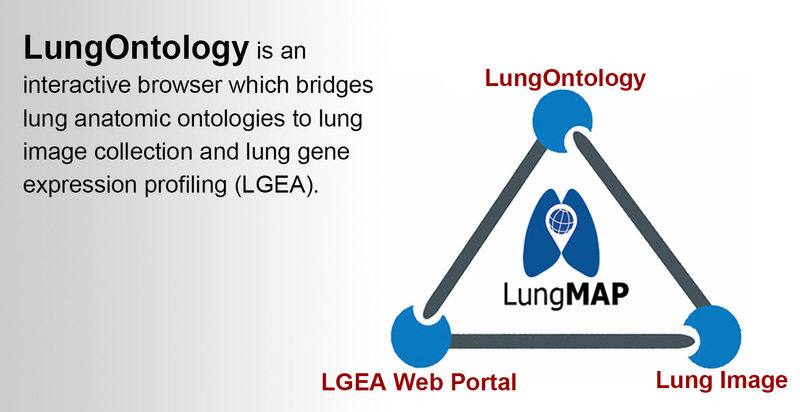 “LungGENS”: a web-based tool for mapping single-cell gene expression in the developing lung. Thorax. 2015;70(11):1092-1094. 2. Du Y, Kitzmiller JA, Sridharan A, Perl AK, Bridges JP, Misra RS, Pryhuber GS, Mariani TJ, Bhattacharya S, Guo M, Potter SS, Dexheimer P, Aronow B, Jobe AH, Whitsett JA, Xu Y. Lung Gene Expression Analysis (LGEA): an integrative web portal for comprehensive gene expression data analysis in lung development. Thorax 2017;72(5):481-84.